Sermon Leftovers: Should Your Church Be Listening to The Profit or The Prophets? Should Your Church Be Listening to The Profit or The Prophets? DISCLAIMER: I have what is likely an unhealthy and irrational dislike for the idea that "churches are businesses." I've heard all the arguments (they have buildings, pay staff, take out loans, etc...) and I find them terribly un-compelling (not really a word, I know). While some elements of church-life may resemble business life, that does not mean churches are businesses. Business exists to accumlate wealth (only ineffective businesses disagree with this). The church exists to give itself away. The two ideas are mutually exclusive. That being said, I think church leaders have much they can learn from business leaders. I have learned an immense amount from friends who are extremely successful in their businesses. However, I would never try to "run a church" the way they run their businesses. Successful leadership is the ability to learn from others without copying everything they do. Shark Tank and The Profit are two business-oriented television shows have recently become extremely popular. I love both shows because they provide insight into the human condition. I also love them because they provide an opportunity to watch wisdom (and often folly) in action. There is much to learn from these types of presentations. 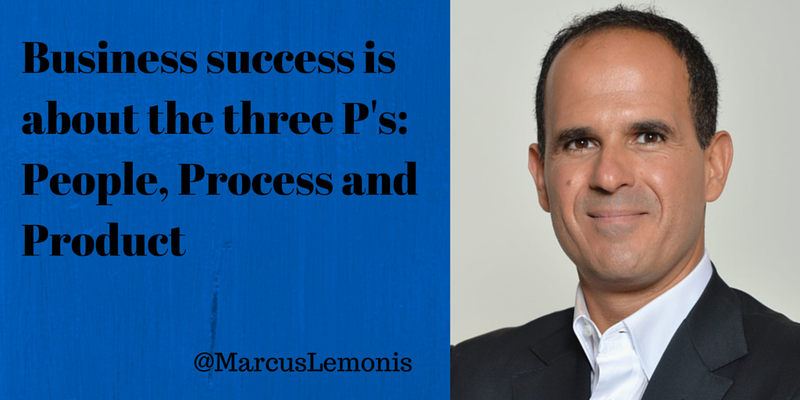 Marcus Lemonis (@MarcusLemonis) is The Profit. He is a self-made millionaire who invests in businesses to enable them to turn around. On every episode of his show he relies on his three fundamental principles to empower his partner's success. He demands they focus on PEOPLE, PROCESS and PRODUCT. For a while, I'd watch The Profit and think about how I might apply it to church leadership. I wrestled with what the three P's of church life were. Who were our people? Were they the people in the seats on Sunday? Are they our staff? Are they the people of our community who we are trying to reach? What is our process? Is it how we connect people to small groups? Is it the "assimilation" process we use to move people from their first visit to being a committed member? Is it how we communicate or how we budget? Is it the way we challenge people to become faithful givers? What is our product? Is it our Sunday morning service? Is it the Gospel? Is it our small groups? Is it the offering? I found myself unable to create a reasonable application of Marcus' principles to the church. Then it hit me. The church is not a business. Church success is not measured like business success. So I began to think about what three principles I might use to pursue church success. If I could alliterate them, it would be even better. Here's where I settled. Church success is somewhat about the three M's. Everything must begin with our message, which is really quite simple. "The Father sent the Son to be the Savior of the world." "Ministry" is a churchy word which refers to the "stuff we do." Our ministries ought to reflect our message. Because the Father sent the Son to be the Savior of the world, what are we doing? How are we interacting with the Father? How are we reflecting the Son? How are we revealing salvation to the world. I fear that the ministries of many churches become overly complicated and complex because the church's have not maintained their focus on the simplicity of our message. My church doesn't have an official "membership." Yet we still call people to be committed to our local body of Christ. Ultimately, a church must have some understanding of what they are doing with the people God has entrusted to them. How are they forming them? How are they caring for them? How are they releasing them into the world for mission? This is obviously not comprehensive. It's kind of a jumping-off series of thoughts. I'd be interested to hear what others think about this... Feel free to comment.